List of archives in Alaska. Archives and Special Collections at the Consortium Library holds a variety of collections, ranging from the early history of Alaska to more recent times. We also hold a variety of types of records from manuscript collections, organization's records, and university records. Archives and Special Collections creates and updates topical guides that list collections related to specific subjects. To learn more about our topical guides, click here. 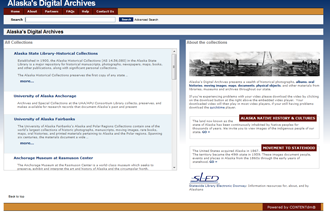 To find photographs, maps, documents, physical objects, audio, and moving images of Alaska online, check out the Alaska Digital Archives. It holds digitized archival material from all over the state.